A sweeping history of the Spanish Civil War, told through a dozen characters, including Ernest Hemingway and George Orwell: a tale of idealism, heartbreaking suffering, and a noble cause that failed. [Hochschild's] vivid descriptions capture both the highest moments of Spain’s Civil War — like the euphoria of liberated Barcelona — and the very lowest ones — like the despair of young soldiers in the trenches, infested with lice, surrounded by dead bodies, and soaked with rain and mud, trying to fight while sustained by a meager gruel of potatoes and dried beans ... Hochschild tells the story of this heady time with moving, well-paced prose exploring both international policy and intensely personal experiences ... Yet Hochschild goes further than merely telling the story. The book is enriched by his stepping aside and sharing the front line reports from the many writers who were in Spain ... [an] exceptional narrative of this often overlooked moment in history. What makes his book so intimate and moving is its human scale. Mr. Hochschild follows the paths of a handful or two of American (and occasionally English) volunteers, as well as journalists, and tells the larger story of the war through their tribulations ... [Hochschild is] a generally sympathetic observer of this conflict’s journalists, but he can also be stern. He criticizes the herd mentality that led journalists to miss one of the war’s biggest stories — how Franco’s side was propped up with oil delivered by Texaco, at the behest of an executive with Nazi sympathies. With all due respect to Orwell, Spain in Our Hearts should supplant Homage to Catalonia as the best introduction to the conflict written in English. A humane and moving book, it is well-paced and meant to be read rather than studied. It might be best described as a post-Cold War history of the Spanish Civil War. Spain in Our Hearts allows its reader to relive, from multiple angles, the emotional and intellectual logic of anti-fascism. That is, perhaps, what will make this book speak to our present moment. 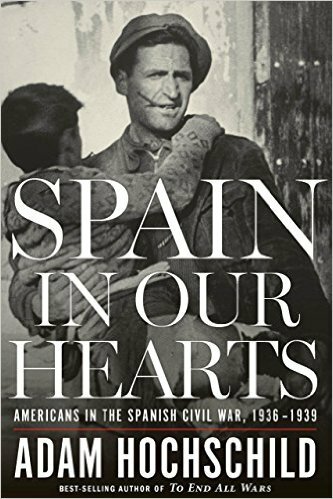 What did you think of Spain in Our Hearts: Americans in the Spanish Civil War, 1936-1939?